How was your weekend? Mine was rather fantastic, especially because it involved a trip to Fresh in Toronto with my roomie Jess and one of our blogger besties, Christina. In between our catching up, laughing and exchanging race schedules for this year, I devoured the Superfood Salad. Hands down, this was one of the best things I’d eaten all week. (Apologies for the less than stellar photo – the DSLR didn’t make it on this trip!) 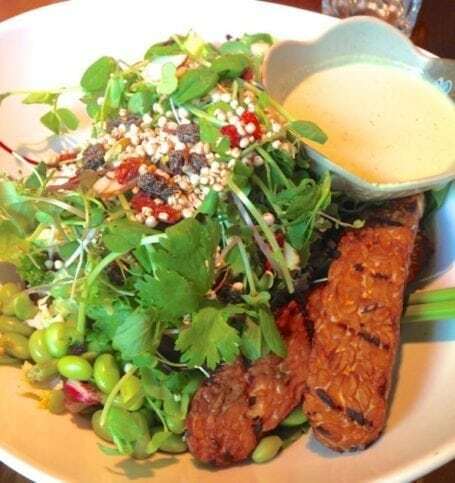 This bowl was full of napa cabbage, cucumber, parsley, cilantro, microgreens, edamame, and Fresh Salad Topper, and I got some grilled tempeh on the side because one does not go to Fresh without getting tempeh. 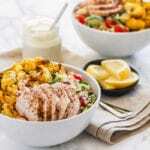 Complete with tahini dressing, it was absolutely delish. Seriously, it’s a good thing I don’t live in Toronto or I’d spend ALL THE MONIES at Fresh. 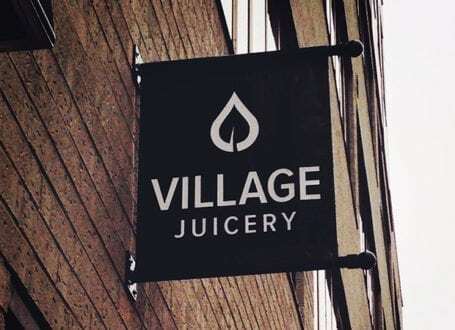 Moving right along, I need to tell you about The Village Juicery which was where Jess and I were headed after lunch on Saturday. We’d been invited for a juice sampling session, something I was super excited about because it’s been far too long since I’ve used my own juicer. As I’m sure you’ve noticed, juices of all sorts are popping up everywhere these days. It leaves us wondering whether they’re all created equal, what to look for in a good juice, and why certain ingredients make a difference. 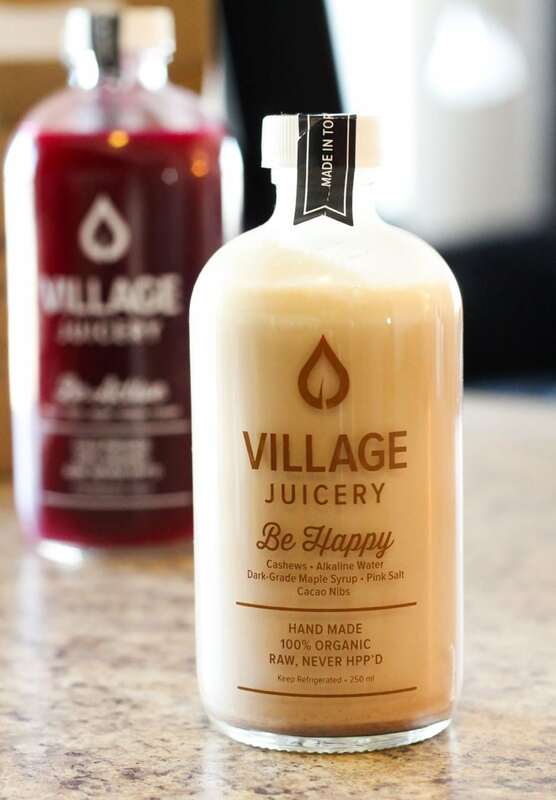 One of the biggest things that sets The Village Juicery apart from those of other companies is that they do not use high-pressure pasteurization, or HPP. What’s that, you ask? Great question. HPP is a technique applied to all sorts of packaged shelved products, including juices in plastic bottles. Products that undergo HPP are put under a very high amount of pressure which extends their shelf life by 10 times, inactivates the vegetative flora, such as bacteria, viruses, moulds and parasites. Sounds ok, right? After all, you don’t want those nasties in your juice. But here’s the thing. 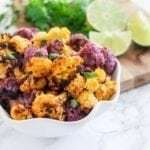 HPP also kills the good gut-friendly bacteria in the juices that our bodies need. 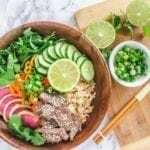 Sure, your average grocery store juices might last several weeks which is fine if you don’t want to waste food, but would you really want to eat an orange or a cucumber that’s 8 weeks old? Me neither. 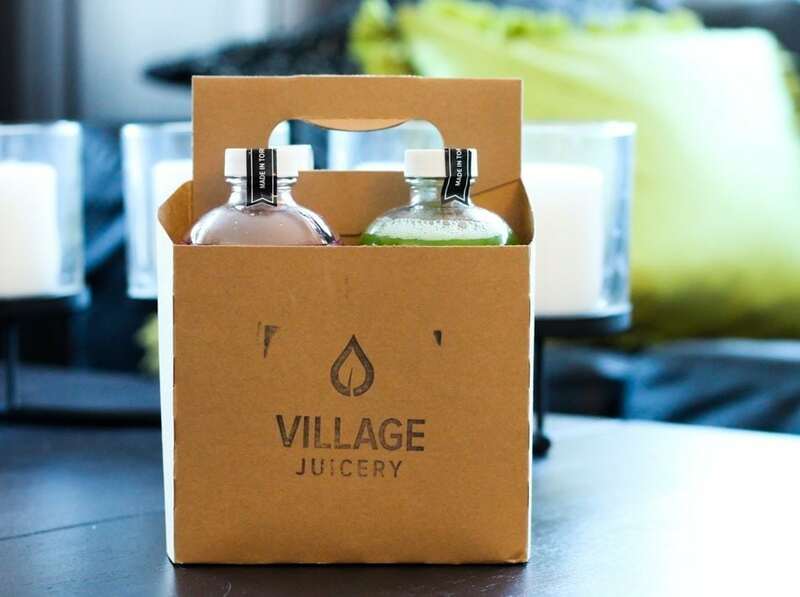 Aside from the fact that The Village Juicery never uses high-pressure pasteurization (yay! 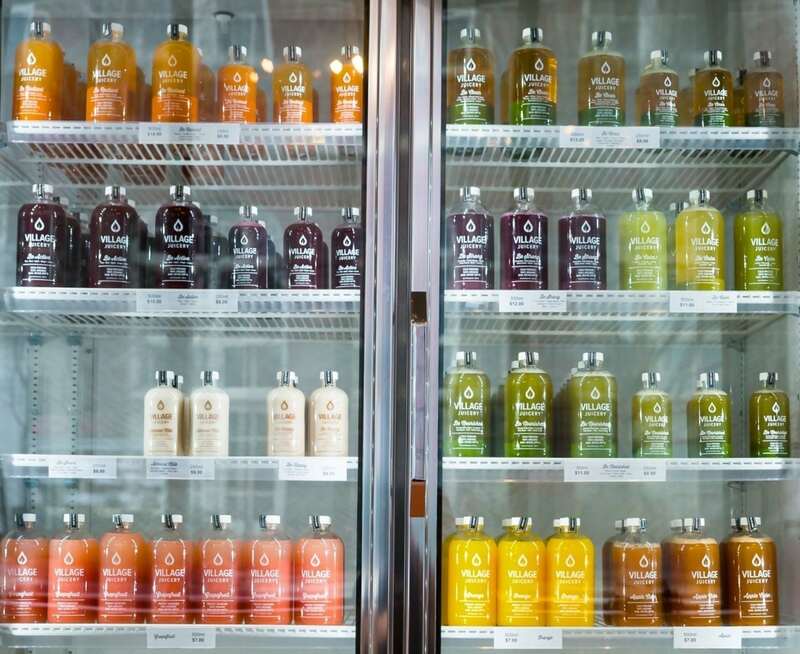 ), their juices are 100% organic. If a particular organic ingredient can’t be found, then the juices that need it go temporarily out of stock. New batches are made every night in the company’s Toronto-based production facility, and the produce is sourced from local farmers. Since the ingredients are 100% organic, you can be confident that your juice contains no GMOs and is bursting with its maximum level of nutrition. Our juice sampling experience was fabulous, and we got to try almost every one of the juices on the menu. They even make nut milks, including this one called Be Happy. 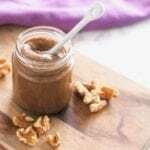 One taste and you’ll know exactly how it got its name – the ingredients are cashews, alkaline water, dark maple syrup, pink salt, and (the best part) cacao nibs. It had a gorgeous creamy, chocolatey taste but wasn’t at all super sweet. That’s another great thing about these nut milks – they’re not over-sweetened with heaps of dates, honey or syrups like others I’ve seen. You better believe I’m going to be attempting a re-creation of this guy in my own kitchen. Back to the juice. Our sampling was led by one of three nutritionists on staff who let me grill her with a whole bunch of juicy (see what I did there?) questions. 😉 While we downed shots of the various blends, she explained the production process, the company’s involvement and support of the local community, and the whole HPP thing which I hadn’t even heard of before. 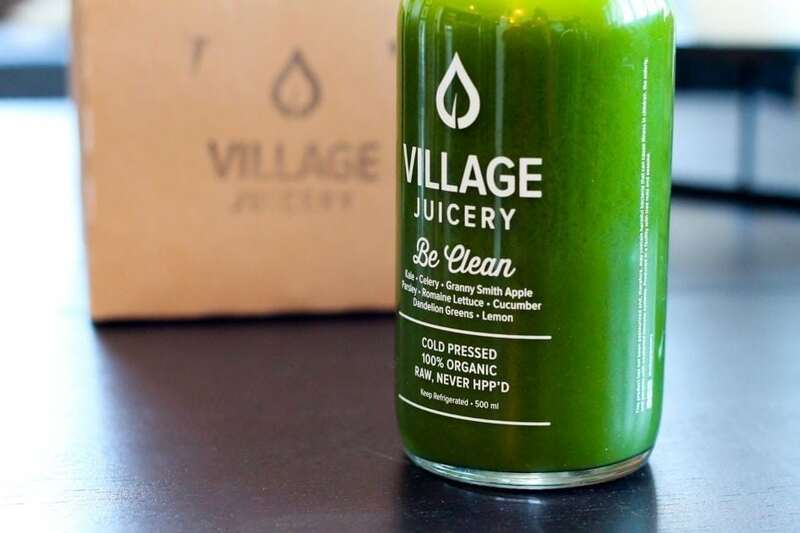 The Village Juicery prides itself on keeping its customers informed about what they’re consuming, and has some great resources on their website to help us understand the issues around HPP, organics and GMOs. Impressive, right? Every single one of the juices were amazing, but my two favourites were called Be Clean and Be Strong. First up: Be Clean. The greenest of the green, this is a blend of kale, celery, Granny Smith apples, parsley, romaine lettuce, cucumber, dandelion greens and lemon. 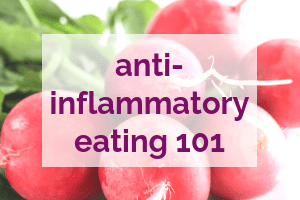 I loved seeing dandelion greens and parsley included in the list because so many juices available in stores only contain spinach and kale. 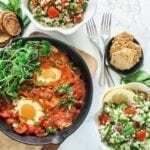 Both dandelion greens and parsley are more bitter, and this is probably why they’re not used as frequently in more mainstream brands’ juices. However, there was nothing bitter about this juice and the various ingredients melded together perfectly. As you can see on the bottom of the back of the bottle, The Village Juicery includes the percentage of fruit, roots, and veggies so that customers can get a sense of how sweet a blend is going to be. (A lot of juices from other companies look green but are pretty much all fruit!) Be Clean is 10% fruit, 0% root, and 90% green. I like my juices to be veggie-based, so this one was fantastic and had just a moderate amount of sweetness. My other favourite was Be Strong, a blend of cucumber, red cabbage, apple, Swiss chard, beets and lemon. 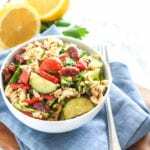 The ingredients are listed in order of quantity used, just like on the ingredients label of any bottled or packaged product you’d find elsewhere. 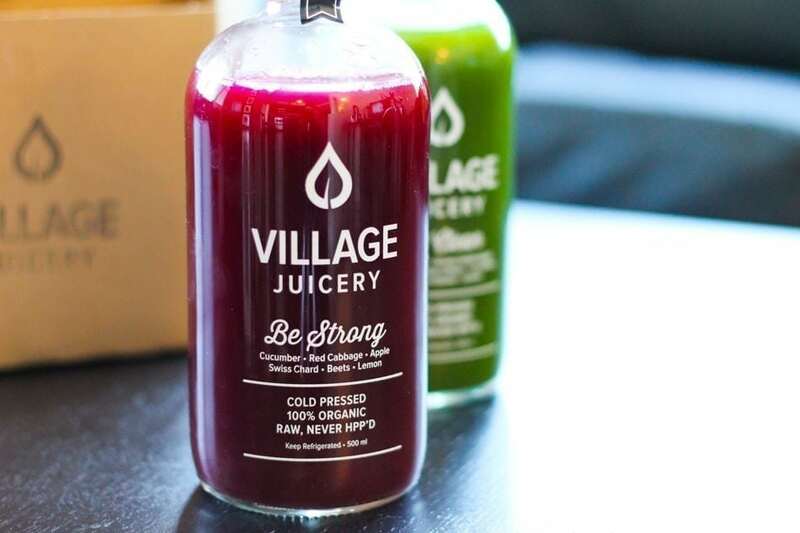 The Village Juicery offers custom juice cleanses, but I’m more the type that likes to integrate them into my diet along with the whole food-based meals that I love. 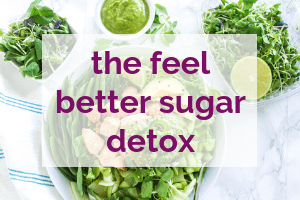 As the in-house nutritionist at the juicery agreed, winter isn’t really the best time for our bodies to be detoxing, particularly those of us living in really cold climates. Although I know there are plenty of people who swear by juice cleanses, I was most interested in the ways their juices could complement my athletic performance. Right now I’m working really hard at nailing down a very solid pre, during, and post-workout nutrition regime for my half Ironman training. 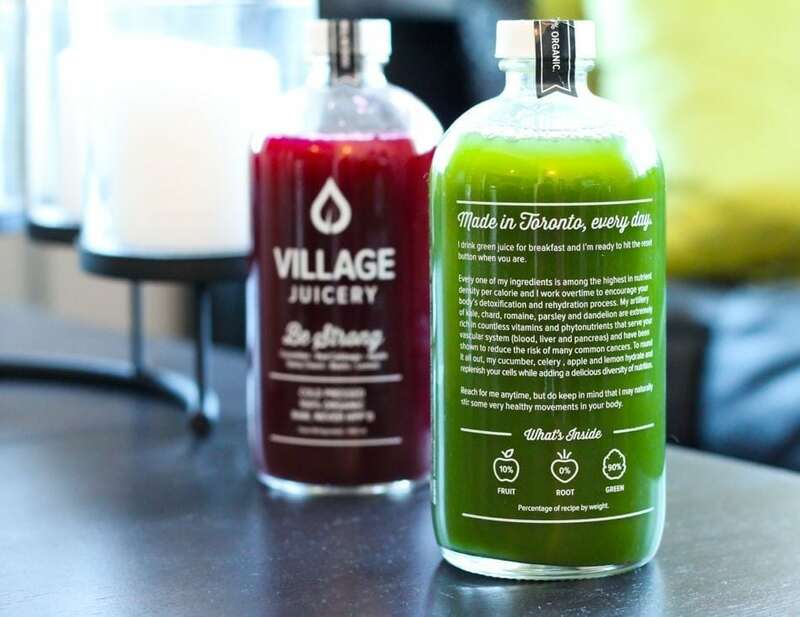 Cold pressed fresh juices like the ones we tried at The Village Juicery (particularly post-workout) are fantastic for this because of their crazy-high antioxidant content, which helps to reduce inflammation and boost recovery. With this in mind, I’m pretty sure adding juices like these to the mix more regularly is going to be happening! 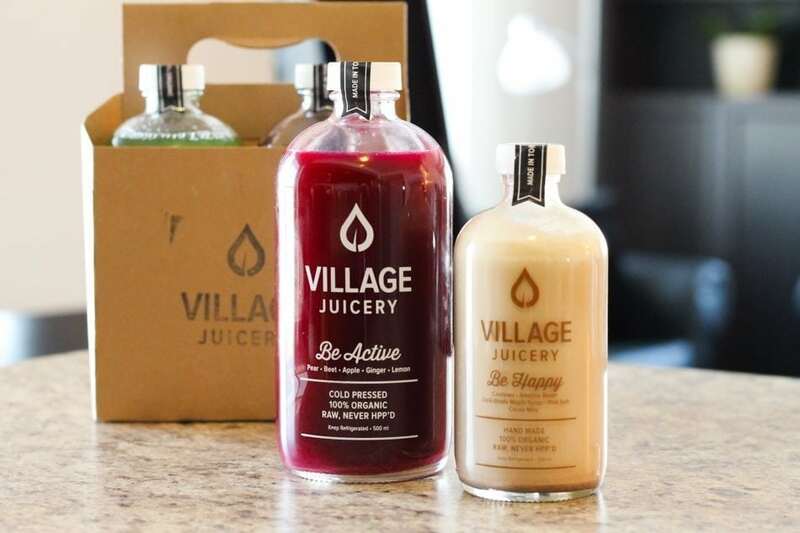 If you’d like to check out The Village Juicery, you’ll find all of their location details for the flagship store and their distribution network here. 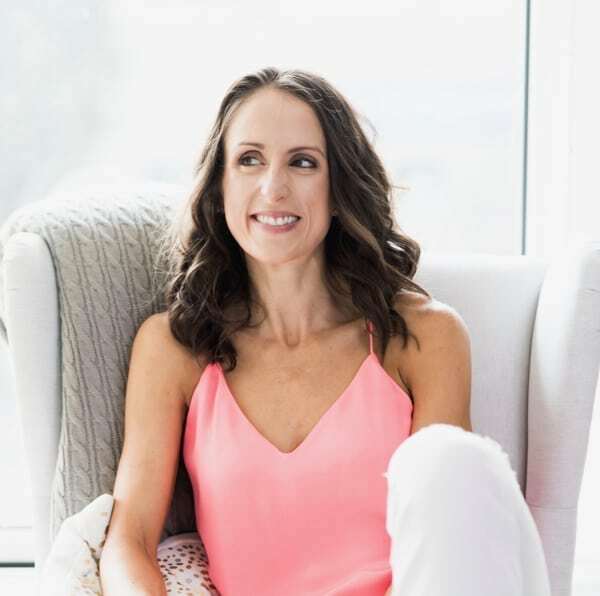 And if you just happen to be available on Saturday January 24th between 1 and 4pm, there’s a launch party happening at their flagship location (540 College St, Toronto). 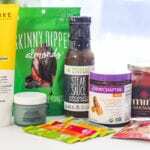 With plenty of juices ready for sampling as well as raw, organic and gluten-free treats from various Toronto-based companies, so I’m sure you’ll be just as impressed as I was! Do you include fresh juices as part of your regular nutrition regimen? Any favourite blends or ingredients? I love anything with ginger, plenty of greens and beets! 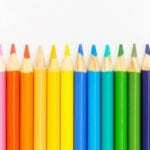 Any big questions about juicing or nut milks? 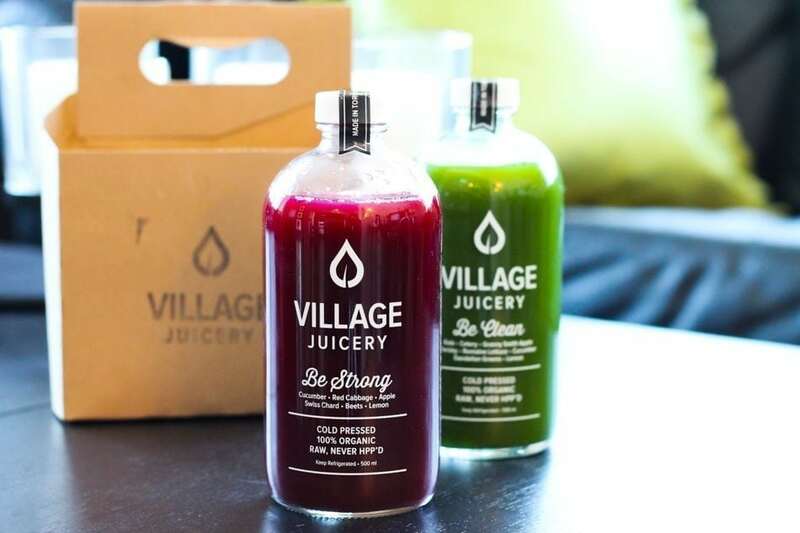 Feel free to leave them below and I’ll pass them on to the experts at The Village Juicery for you! Aren’t they gorgeous? I’m totally planning to re-use them! have a great week and happy new year!!! These look awesome! I’m from Michigan though and I didn’t see how I could go about getting them shipped to me in the States. Do you know if that’s an option? I travel to Canada frequently with hockey so I could always pick some up next time I’m there but with the short shelf life that is not my ideal solution. Girl. Don’t get me started on the Be Happy. I am drinking that like a CHAMP. I don’t juice much during the winter, but come summer, I am planning on making ALL THE BEET JUICE. Perhaps we should get a big container for our fridge? Whoa, The Village Juicery looks amazing! Sorry I missed you guys on Saturday! We will need to plan a Part II at Pure! Yes please! We missed you! !